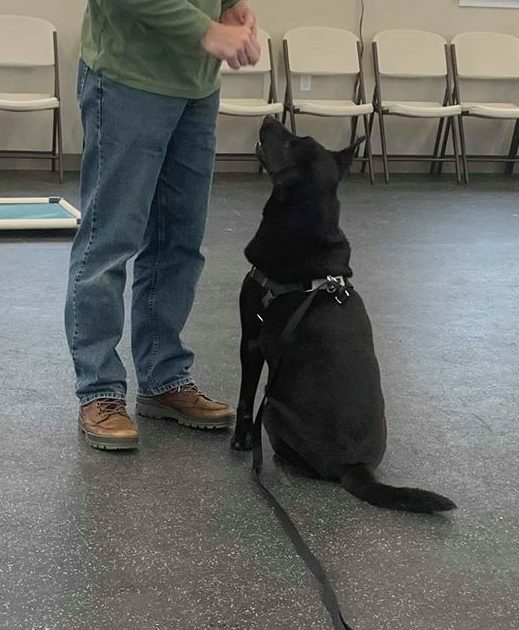 Whether it be a puppy or an adult dog, obedience class is a great way to build the bond between you and your dog and help you to have a happy and healthy relationship with your favorite furry friend! Learn different ways of training and what works best for you and your dog! Learning new skills and teaching new behaviors will build your confidence and make training more enjoyable for both you and your dog. • Leash: 4-6 foot leather, nylon, or cotton leash. Please no retractable leashes or chain or choke collars. • Collar: Martingale or nylon collars are acceptable. • Treats: Small, tasty, and easy to eat! Cut up hot dogs, cheese, or lunch meat can be a great motivator! Owners are required to send proof of vaccinations for Distemper combo vaccine. Bordetella and Rabies vaccines are also required for appropriately aged dogs. Puppies MUST have at least 2 Distemper combo vaccines to attend class. Places in class can only be held if both payment and proof of vaccinations is received. Fees are non-refundable. Punch cards are valid for 12 weeks from the date of purchase. Started in 1989, the Canine Good Citizen Program (CGC) is designed to reward dogs who have good manners at home and in the community. The CGC Program is a two-part program that stresses responsible pet ownership for owners and basic good manners for dogs. All dogs who pass the 10-step CGC test may receive a certificate from the American Kennel Club as well as their owner having bragging rights that their dog is a Good Citizen! Owner and dog must attend all six classes in order to be eligible. The American Kennel Club S.T.A.R. (Socialization, Training, Activity, Responsibility). This class will teach you how to best communicate with your puppy. Organized training classes also provide an opportunity for your dog to socialize with other dogs. You’ll be able to get information on all of your puppy-raising questions including house-training, chewing, and the most effective way to teach practical skills such as coming when called. Upon completion of the course, your puppy will be eligible for the AKC S.T.A.R. Puppy Medal along with other recognition incentives. 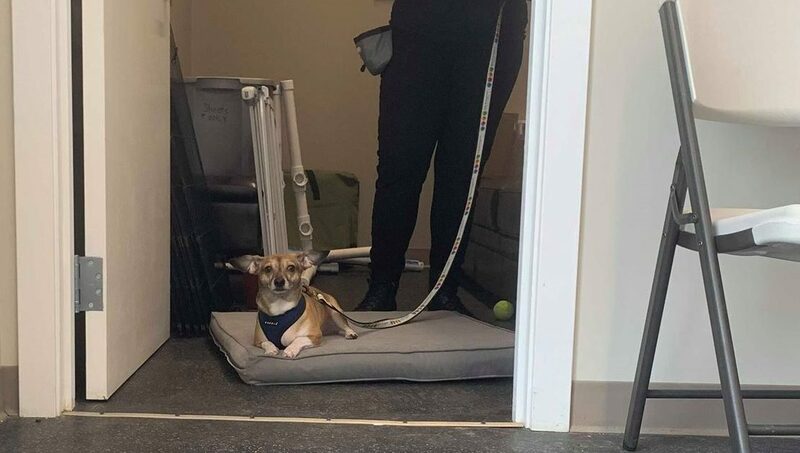 Owner and puppy must attend all six classes to be eligible. No matter the age, your dog can learn new tricks and improve his or her manners! This beginners class covers the basics like sit, stay, down, come, leave it, walking on a loose leash and much more. This class is a must for the dog and owner who have not attended an obedience class before. This is an introductory course to basic puppy obedience. We will start to build your puppy’s command set and expose puppies to a variety of new adventures. In addition to class time, puppies will have the second half of the class to socialize with other puppies in supervised and safe playgroups. Early socialization is a crucial part of your puppy’s development. 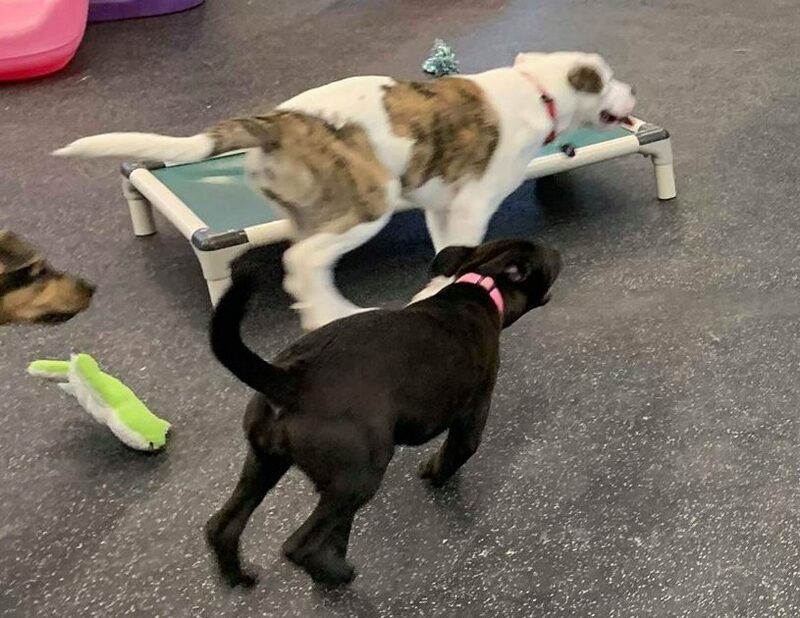 This drop-in playtime is an easy opportunity for your puppy to learn social skills in a safe and supervised environment. We create compatible puppy playgroups to ensure that everyone has a positive experience. 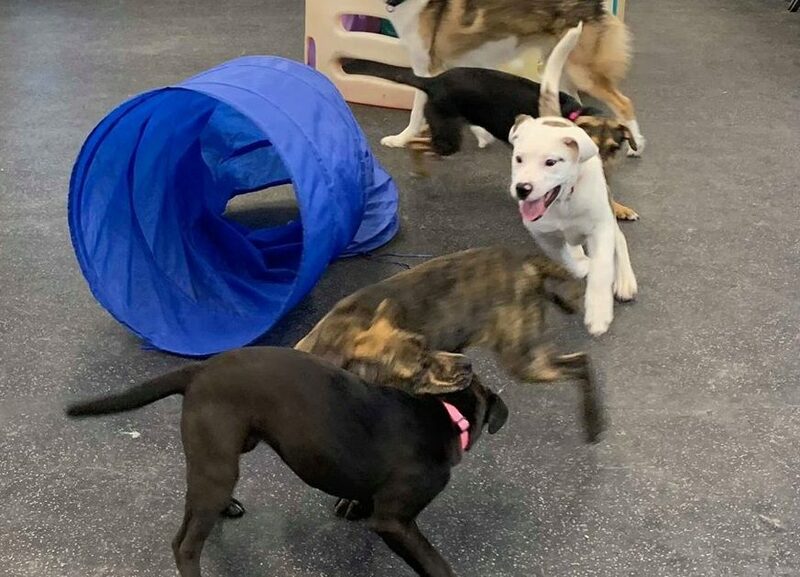 Puppies will have the opportunity to play with other puppies along with breaks specifically intended to socialize puppies with other people as well. Through tailored play areas, we will also expose your puppy to new objects and experiences. Paula Smith is a certified professional dog trainer through the Certified Council for Professional Dog Trainers and is the owner of Dog Blessed, LLC. Paula strives to enhance the lives of dogs and teach others about dog behavior and humane science based training techniques. Paula is a member of the Association of Professional Dog Trainers, Muskegon Lakeshore Obedience Training Club, and PAWS in Grand Rapids. In her spare time, she likes to spend time training her own dogs and trialing in Agility and Nosework. Her dogs hold titles in CPE agility, AKC agility, UKC, AKC, and NACSW Nosework, Therapy Work, Advance Canine Good Citizenship, Tricks, Rally, and are always trying new things. Her goal is to strengthen the relationship between humans and canines in the home by focusing on enhancing cross species communication. She uses scientific based training focused on positive reinforcement and classical conditioning. Description: Shy Dog Class is designed for dogs that are fearful of other people, noises, etc. We will teach you how to use desensitization and counter conditioning to things they fear. We will also use positive reinforcement techniques to increase their confidence and teach you how to communicate better with them. Description: Agility is a fun sport that can help any dog build confidence. 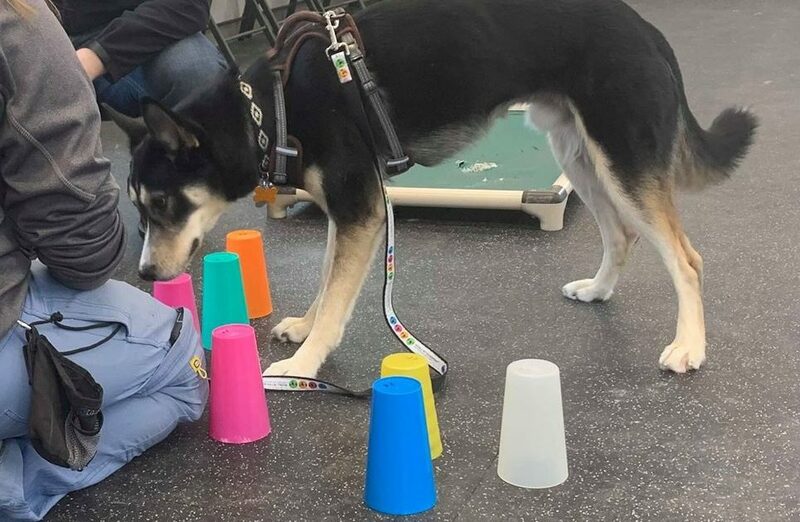 In this class, dogs will learn basic agility obstacles and body awareness exercises. Handlers will learn about leading dogs on an agility course. Dogs should have a strong recall for this class and be able to be crated when not working. This class is a must for anyone looking to explore the fun and exciting world of agility! Description: Have you successfully completed an obedience class and now wonder what’s next? We have the class for you! In this class, you will build on your dog’s skills and explore your dog’s tricks to keep expanding their learning, building your bond with your best furry friend, and learning cool tricks to entertain your humans! Teach your dog to lay on their bed when company is present, help your dog learn to balance, or get in or on stationary objects. Your imagination is your only limit! Join us to expand on your basic obedience and maybe even earn some trick titles through AKC. Description: Are you embarrassed to bring your dog in public? Does your dog lunge and bark at people? Does your dog go nuts on a leash when he sees another dog? Then this class is for you! We know that this can be a frustrating problem and difficult for the person at the other end of the leash. You may not understand why your dog does this or why you can’t get them to stop it. Through the class, we teach handlers why this happens and how best to deal with it. We then work to teach dogs alternative behaviors to being reactive. This is the perfect class to help you make those evening strolls enjoyable and not stressful!